Another stamp for mythical independent Alaska. 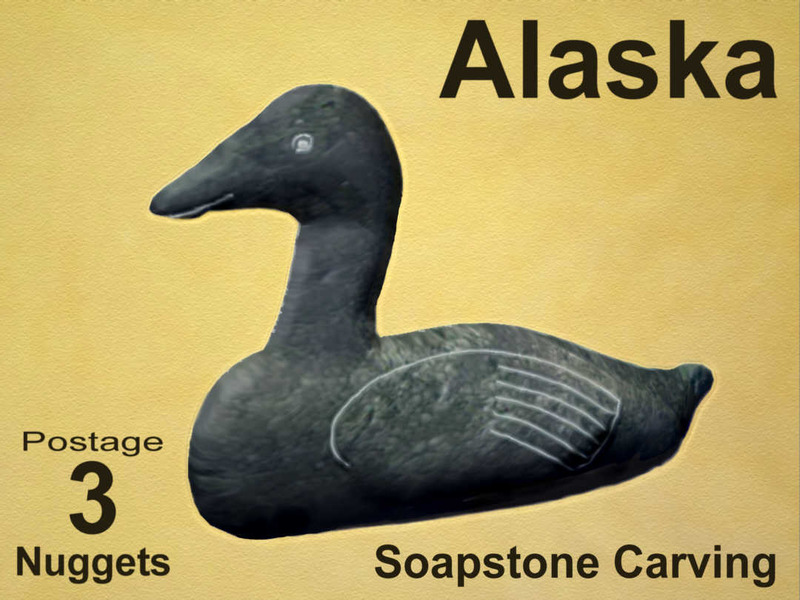 An Eider Duck carved from soapstone. Soapstone is so named as it feels rather like soap due to talc in the rock. This is not a photograph of a soapstone carving, but a 3d model I was able to produce. Looks nice with the soapstone texture and the incised lines which are actually painted on. The background image is brain tanned moosehide. The Common Eider, Somateria mollissima, is the largest duck found in Europe and in North America (except for the Muscovy Duck which only reaches North America in a wild state in southernmost Texas). The Eider is distributed over the northern coasts of Europe, North America and eastern Siberia. It breeds in Arctic and some northern temperate regions, but winters somewhat farther south in temperate zones, when it can form large flocks on coastal waters. It can fly at speeds up to 70 mph (113 km). The species is often readily approachable. Drakes of the European, eastern North American and Asia/western North American races can be distinguished by minor differences in plumage and bill color. This species dives for crustaceans and molluscs, with mussels being a favored food. The Eider will eat mussels by swallowing them whole; the shells are then crushed in their stomachs and excreted. When eating a crab the Eider will remove all of its claws and legs and then eat the body in a similar fashion. It is abundant, with populations of about 1.5-2 million birds in both North America and Europe, and also large but unknown numbers in eastern Siberia. Eiders are colonial breeders. They nest on coastal islands in colonies ranging in size of less than 100 to upwards of 10,000-15,000 individuals. Female eiders frequently exhibit a high degree of natal philopatry, where they return to breed on the same island where they were hatched. This can lead to a high degree of relatedness between individuals nesting on the same island, as well as the development of kin-based female social structures. This relatedness has likely played a role in the evolution of co-operative breeding behaviours amongst eiders. Examples of these behaviours include laying eggs in the nests of related individuals and crèching, where female eiders team up and share the work of rearing ducklings. The eider’s nest is built close to the sea and is lined with the celebrated eiderdown, plucked from the female’s breast. This soft and warm lining has long been harvested for filling pillows and quilts, but in more recent years has been largely replaced by down from domestic farm-geese and synthetic alternatives. Although eiderdown pillows or quilts are now a rarity, eiderdown harvesting continues and is sustainable, as it can be done after the ducklings leave the nest with no harm to the birds.